Drilling operations were completed Monday, October 24. Concrete foundations work is continuing. Because of the rain, the grade pour original scheduled for Oct. 27 has been moved to Oct. 29. So far, one-fourth of the grade beams for the garage have been set. Throughout the end of this week and most of next, numerous dump trucks hauling both dirt and rock will arrive on site. Demolition of the east wall in the existing garage has been completed. The precast erection crane is expected to be mobilized next week. The crane will take approximately two days to erect. Once up, it will start pulling the precast panels off the existing garage. This will cause the temporary loss of approximately 40 parking spaces in the garage for safety reasons. Those spaces are expected to be restored by the first week of December. 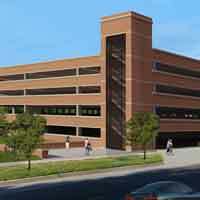 The new precast panels for the garage extension are scheduled to arrive Nov. 7. Because of numerous trucks delivering parts of the precast crane, as well as the trucks with dirt and rock for site fill, expect some traffic delays on Garden Avenue. The second round of testing in the building enclosure mock-up of the ISB (located on the southwest corner of Parking Lot K) has been rescheduled to 1 p.m. today (Oct. 28). Structural steel erection is continuing and is scheduled through Nov. 22. Concrete pours for the second and third floors is continuing through next week. That work will continue on levels 2, 3 and 4 through December 1. For more information about the on-campus construction, visit webster.edu/construction.